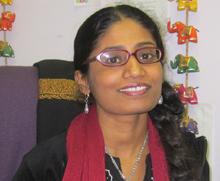 Shreerekha Subramanian is an Assistant Professor of Humanities at the University of Houston-Clear Lake. She teaches courses in humanities, literature, women’s studies and cross-cultural studies. She is the first recipient of Marilyn Miezskuc Professorship in Women’s Studies in 2008. She finished her doctoral work in Comparative Literature at Rutgers University where she received awards for distinguished contribution to undergraduate education and teaching. She co-edited Home and the World: South Asia in Transition (2007) and has published chapters in several anthologies such as The Masters and the Slaves: Plantation Relations and Mestizaje in American Imaginaries and New Essays on the African American Novel, and also articles in academic journals.